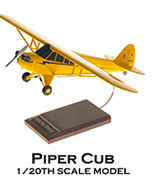 This 1/20th scale hand-carved mahogany model ia an exact replica of the Piper J-3 Club featured in the film. It is a collector's piece that is 20% larger than the standard 1/24th scale version, with a 20" wingspan and a length of 13.5". Color matched to the actual airplane, it comes complete with a custom designed "One Six Right" stand.